So yesterday I took my trusty bike and went for a ride into the past. I rode out to Rehoboth to the house we built back in 1974/1975. I was 25 years old at the time and apparently arrogant enough to think I could actually build a house. I really didn’t think twice about doing it, I just knew that I couldn’t afford a carpenter so I bought a hammer. We were willed a small parcel of land from Zella Ormsbee who was like a Grandmother to Carol when she was young. Such a nice gesture and it changed our lives. Carol and I got engaged on November 1st 1969 - 49 years ago - and were married in February 1970 while I was still in the US Navy. By early 1973 when we were both in college I was drawing up plans for a house..I had taken a course in architecture and I wanted a house that took its’ lines from American barns. 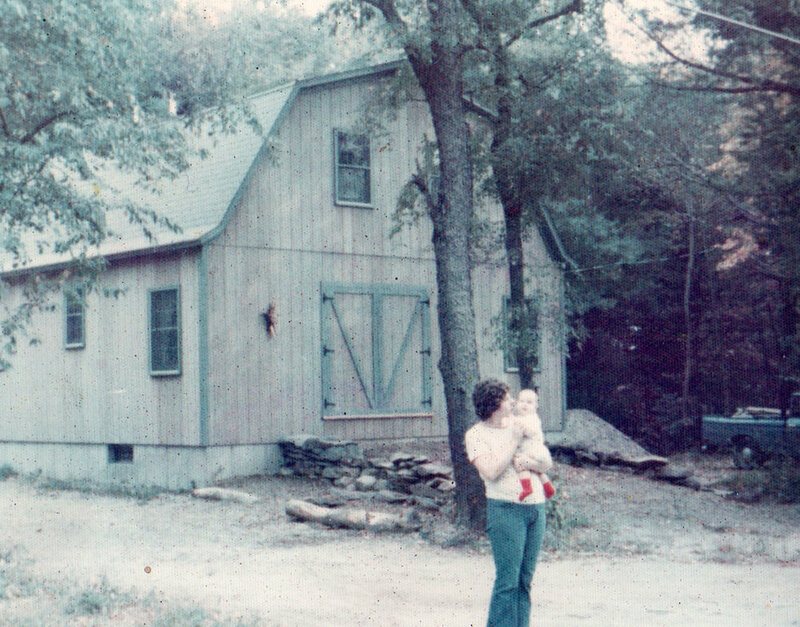 We started construction in September of 1974 and moved into the house almost exactly one year later on September 14th 1975, just a couple of weeks before my son’s second birthday. While building the house Carol gave birth to our daughter Megan, in March of 1975, and continued to help with the construction, hold down a job, and attend college, and be the best Mom around. When I started construction of the house I was working at A.J. Spokes, a bicycle shop in Providence and cycling was a passion. I was also attending college and doing all of the construction of the house. When most people say they built a house they mean that they have hired contractors. Our house was a bit more home grown. Like I said, I designed the house, drew up the plans and got approval from the town. We got a construction loan from a bank in Fall River for $20,000 - and I bought a hammer and was armed with very little actual knowledge on how to build a house. We flew my Dad out from Illinois and for the first two weeks in that September back in 1974 we framed the house and I increased my skills… Dad was an amazing workhorse and the best teacher one could ever ask for. Even though he had never built a house he was an awesome woodworking craftsman. His day job was building interiors for executive aircraft. So we did succeed in building the house - Carol and I did almost all of the construction ourselves - and when we moved it was complete. We had seen too many friends move into a home that wasn’t finished and just never got around to finishing so we made a pact with each other that the house would be finished when we moved in. The only thing missing was the carpet in the living room and it was scheduled for the next week, and arrived right on time. And we came in on budget, completely furnished and applianced. We lived in that little homemade house in Rehoboth for almost 25 years before we sold it to go cruising….but that story is for another day. 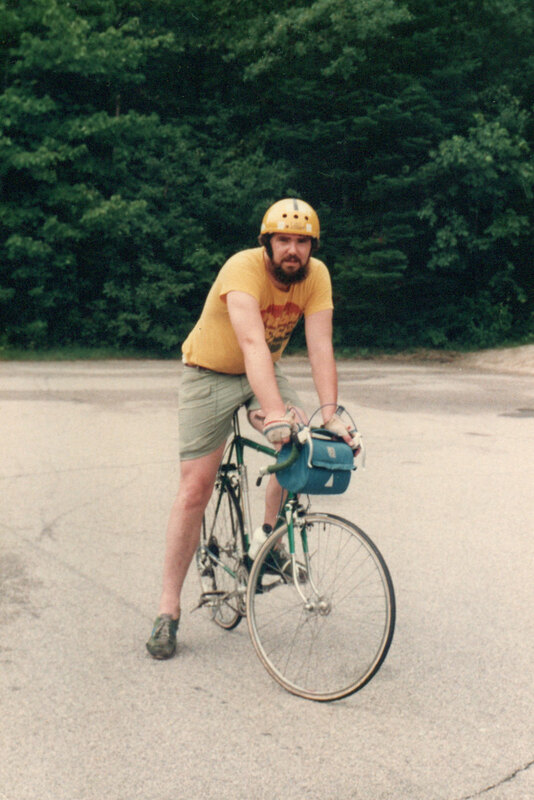 Me around 1976 or so riding the Kancamagus Highway in New Hampshire. Back to my bike ride. Like I mentioned I had a passion for cycling and I can remember where that passion started. All of you old hippies out there remember the Whole Earth Catalog…which was kind of a Sears catalog for folks with alternate lifestyles. Well it had a picture of a 10 speeder touring bicycle for long distance riding. In our first year of marriage Carol and I got a couple of three speed Royce Union bicycles and rode all over Illinois where we were living at the time. I was hooked and have had bikes ever since. I think at one point I had 14 bikes in the stable, today I think we are down to only five. An if anyone need to know the right number of bikes to own, there is a formula. N+1 —- this is the formula to compute the correct number of bikes. N = the current number you own. . . So I rode out past the old homestead in Rehoboth only to find a lot of changes. The vertical barn boards are gone, replaced with vinyl siding, a new addition has been built on the south side. Several trees have gone missing and the driveway was full of toys. . . . it just wasn’t the same. It is not home anymore just a house we built a long time ago. Don’t mistake my words, there are so many fond memories of our time building it and living there and raising the kids, but they are just that, fond memories. We are now living elsewhere and making new memories, even after nearly 50 years, every day is new and every day brings adventures large and small. Adventures like going on a nice bike ride in the country and having the quiet time to remember all those days spent so long ago. Just about every mile of the ride provided me with a reminder of change. New houses were everywhere, the farmland was disappearing and the urban sprawl continues. My son Jason and I used to call this the ‘yellow ooze’ as even back then we were aware of the way open land was slowly being eaten by ‘progress’ and I think you are more acutely aware of the ooze when traveling through on a bike. I think you are more aware of just about everything, and this day has made me thankful for every adventure, every friend and a life that is working out OK. I think I will go for another ride when the rain stops. . . . The homestead today. Still standing after nearly 45 years. . .